"Baby it's cold out there"
We had a really mild autumn and it's pretty cold outside now, so we wanted to talk about feeling warm! We love soup for lunch in the office and are regularly inspired by the offerings of our eho chefs - check out Marianne's split pea and sausage soup. Soup can be simple to make and you can find recipes online. Linda is not a chef and uses her 'bung it all together' recipe: chop and fry large onion and couple of cloves garlic, add roughly chopped sweet potatoes and carrots, pour over stock, add chilli flakes and herbs, bring to boil, simmer for couple of hours, whizz with a blender and enjoy. She's making cauliflower and sweet potato soup today and adding some garam masala instead of chilli - hope it tastes just as good! What's your favourite soup? Roast dinners don't need to be saved for a Sunday lunch - they're actually simpler to make mid-week than a more complicated recipe. Put your veggies in a steamer whilst you're roasting the meat. If you do a good variety of vegetables, you don't even need to add roast potatoes if you're going through a 'lose a few pounds before Christmas' phase! Slow cookers are great for this time of year, especially if you're out all day working - prep everything the evening before and pop in the pot in the fridge. Next morning add the stock and meat, stir well and put on 'low cook' until you get home in the evening. Double up the quantities and you've got a couple more meals for the freezer too. This time of year is spectacularly tricky for commuters as you need a thick coat for walking to/from the station, but it can get hot and sweaty on a busy tube or train! Unfortunately, we can't offer a solution for that, but we do empathise! If you're a walker (with or without a dog) then waterproof boots are a fantastic investment, together with some thermal socks because, generally, if your feet are warm, the rest of your body feels warmer - not sure if that's fact or fiction but it seems to work! One treat is definitely a thermal hat and gloves for keeping toasty in the winter months - it is reported that more heat leaves your body through your head than anywhere else in your body. * Sunshine breaks - the Canary Islands are perfect for springtime holidays abroad. Remember to avoid school holidays for the best bargains! Lanzarote is a personal favourite if you can cope with black sand - there's some culture in the form of Timanfaya National Park and apparently the diving is good there too! 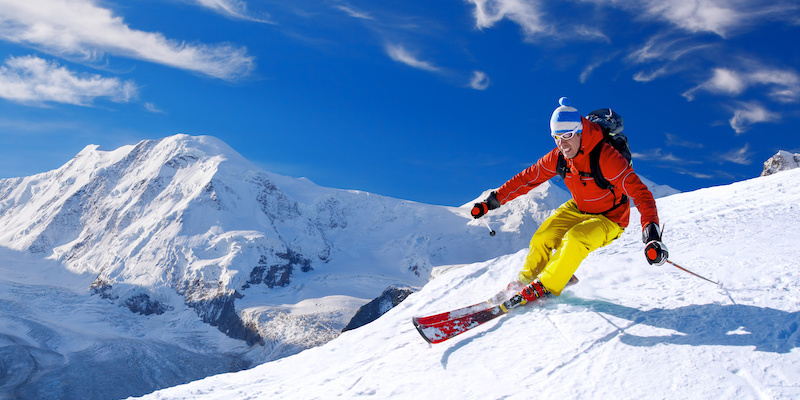 * Skiing holidays - the experience of skiing on snow in sunshine is something quite spectacular and so many places to choose from in Europe or further afield such as Canada. * When you're looking for a two day break in the UK, it can be so frustrating when the minimum rental is for a full week, so why not consider Airbnb who often have availability for odd days. * A change is sometimes as good as a rest, so why not spend a day clearing out a cupboard and donating anything you no longer need to a charity shop or sell it on one the secondhand online shops. We sincerely hope that this blog has inspired you to 'think warm' and make plans for something to look forward to. Why not plan an evening with friends and book an eho chef for your next get-together? We'd love to hear from you and our menus start from just £25 per person. As always, you can drop us an email at foodies@ehochef.com, tag us on Instagram (@ehochef) or put a post on Facebook where you will also find regular news and top tips and call us any time on 020 7183 1628.